SSOR wants to thank Dr. Scott Wingerter of Dickson-Diveley Orthopaedics for this guest post on total hip replacement treatment and surgical options. The “team approach” to patient care is vital & the staff at SSOR feels that it’s important for orthopaedic surgeons and physical therapists to work together to maximize patient satisfaction and outcomes. Thank you Dr. Wingerter for contributing to this post. To schedule an appointment with Dr. Wingerter, call 913-319-7600. 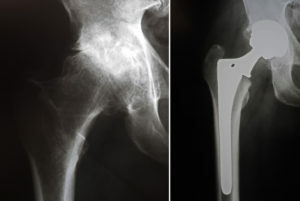 Total hip replacement is becoming more and more common with our aging population in the US. It is one of the most common hip surgery procedures that we do. It’s one of the most successful surgeries of all body parts of all time that we’ve ever done. The advantages of it are multiple, and the risks associated with it are becoming less and less. What factors make someone an ideal candidate for hip replacement surgery? The typical patient needing hip replacement complains of groin pain that can be an aching pain or sharp pain. Not all patients have the same manifestations of hip arthritis though. The ideal hip replacement patient is not overweight, does not have heart problems, does not have diabetes – but none of those things in of themselves prevent you from being a good hip surgery candidate. How do you manage patient expectations for what happens after hip surgery? Patient expectations are extremely important for the discussion of hip replacement surgery. We have to know ahead of time what their activity level is, and what the goal activity level is. What is the difference between the anterior and posterior approach to total hip replacement? 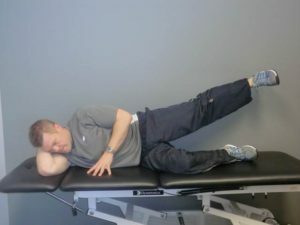 The mini-posterior approach to the hip is in line with the standard posterior approach to the hip. However, it’s a much less invasive hip replacement surgery. This is both from a skin-incision standpoint as well as a muscle standpoint around the hip. In general, the mini-posterior approach is applicable to all patients. How “mini” is variable: larger patients often end up with larger incisions that correlate with their size, but beyond that, it is still much less invasive than hip replacement surgery used to be. For more information, here’s a very informative link that talks about the differences between the anterior and posterior approach to hip replacement given at the American Association of Hip & Knee Surgeons (AAHKS). This link is from the same surgeon on why he no longer uses the anterior approach. For a simpler breakdown comparing anterior to posterior approaches this table is very helpful. What should patients expect in terms of recovery and physical therapy after total hip replacement surgery? Recovery from total hip replacement, at the end of the day, is get up and walk on it. I want you using the hip, and I want you using it as much as possible. Immediately after surgery, we’ll have you work with physical therapy and begin mobilization within the hospital. You’ll often use a walker or crutches for about a week or two, primarily because I want you to learn to walk without a limp. The main limitation of any surgery and having had hip issues before the surgery is that the muscles are weak, so we have to strengthen them after we’ve now eliminated the source of the hip pain. Usually, your physician will guide when he/she wants you to start physical therapy. They may have you do a few weeks of home-based physical therapy because leaving the house is just too painful. Most of the time, this is about 3 weeks or so. During this time of home-based physical therapy, you’ll of course work on range of motion (ROM) and strengthening, but also such things as getting in/out of the shower and on/off the toilet. Believe it or not, those seemingly simple activities are challenging after a total hip replacement. Once you get to outpatient physical therapy, the focus will be on restoring your ROM and strength. 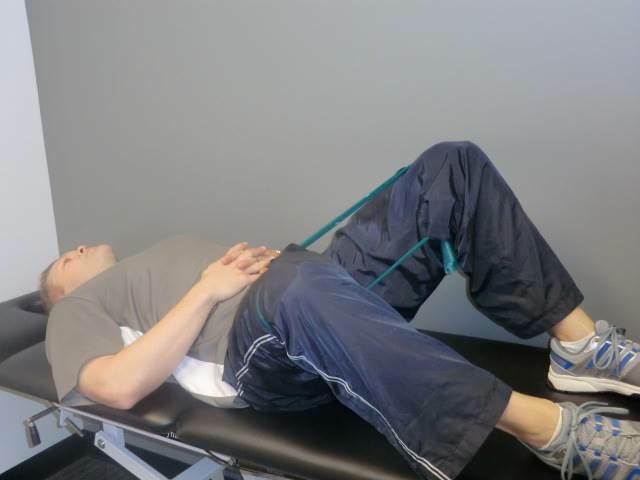 However, one of the things that we do at SSOR that makes us stand out from our competitors is the extensive soft tissue work we do on the areas surrounding the hip. Years of dysfunction and pain have left a quagmire of tender points and soft tissue limitations that not only contribute to pain, but also affect muscle function. In fact, we see many patients from other facilities and without question, this is what stands out to them – the hands-on attention. After we get your range of motion back and get you walking normal again, we’ll go to work on getting your strength back. We start with exercises on your back and side to build a base, then gradually add things like step ups and squats to get you stronger for your day-to-day activities. In addition, we’ll do strengthening exercises for muscles that support the hip like the quadriceps and calves. When is formal physical therapy over? Obviously, we’re a little biased, but we never feel like PT ever ends! “Structured” physical therapy typically goes for 6-8 weeks. After PT is formally complete, you should continue a structured program to prevent a decline in physical function. At SSOR, we offer a program that you can continue your “therapy” with us through a “therapy gym” membership. We’ll see up your program for you, make sure you are comfortable with how to perform exercise and use the equipment, and you can come and go as you please and as often as you like. Plus, we’re here to answer any questions or concerns you may have. If you already belong to a health club/fitness facility, continuing your exercises is imperative. Furthermore, it will help keep your weight under control which will increase the life of your total hip replacement. At SSOR, we’re big on giving patients specific tasks they need to achieve to ensure the best outcome. We like to see that you are walking normally and taking stairs in a “normal,” reciprocal fashion without using railings (if appropriate). Additionally, your balance should be the same on both sides. We also like to see that you can lay down on your uninvolved side, raise your operated leg up and down with perfect form and be able to hold it against our resistance. Finally, we want to make sure that your pain is minimal at best and you are well-versed in techniques to alleviate pain if it surfaces. Sidelying leg raise. The ability to do this correctly is a milestone after hip replacement. Without the ability to perform this, chronic hip pain can result. You should expect more from your physical therapy after total hip replacement than just a sheet of exercises. In order to truly reduce pain and maximize your function, you should expect your physical therapist to get their hands on you and perform soft tissue and joint mobilizations, then give you a specific strengthening plan. Therapy after total hip replacement is more than just exercises – it’s a comprehensive approach to help you achieve your goals. It would be a privilege to serve you, give us a call. We have locations in Overland Park & Prairie Village to serve you.